Great Southern Land DVD Review While Great Southern Land will just prove tedious for some, it is worth a watch just to see some beautiful aerial photography on film. 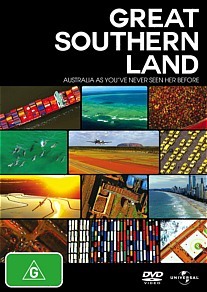 Great Southern Land is a documentary television series which looks at the way Australia operates as a nation. Presented by Professor Steve Simpson, Great Southern Land documents the factors, both natural and man-made which allow Australian’s to go about their everyday life. The series consists of four episodes, each of which looks at a different aspect of our land. Simpson takes us through close inspection of how we receive food and power, the relationship between the natural and man-made world, our daily transport methods and how we able to habituate where we do. Even though some of the parts of our nation and its story which Simpson explores are very interesting, there are some very “ho-hum” moments where the mind starts to wander and lose interest. What Simpson has got to say on everything is very well researched and the hard work done by him and the producers of the show is appreciated, but it is not for everyone. Episode one, which looks at food and power has many of these “ho-hum” moments, while episode three which looks at people on the move is more captivating. The best thing about this television is the beautiful aerial photography. The aerials shots of many Australian landscapes and also those of some of Australia’s famous landmarks are breath-taking. It truly is a very unique perspective Simpson shows us. There are some chilling shots of workers scaling electrical wires, intriguing shots of transport networks, interesting shots of urban landscapes and gorgeous shots of the Australian outback. The DVD extras of this series include interviews with Professor Steve Simpson, executive producer Steve Bibb and series producer Ivan O’Mahoney and an aerial loop. If the part of this series which you find most intriguing is the aerial photography, then the aerial loop is going to be the highlight for you. It is understandable why some people who are not 100% interested in all Simpson has to say would just skip to the aerial clip. While Great Southern Land will just prove tedious for some, it is worth a watch just to see some beautiful aerial photography on film.